Way back in the early days of the accountability movement, Jeb Bush’s Florida developed an innovative approach to evaluating school quality. First, the state looked at individual student progress over time—making it one of the first to do so. Then it put special emphasis on the gains (or lack thereof) of the lowest-performing kids in the state. Many of us were fans of this approach, including the focus on low-achievers. It was an elegant way to highlight the performance of the children who were most at risk of being “left behind,” without resorting to an explicitly race-based approach like No Child Left Behind’s. By focusing on the lowest-performing students, we want to create a system that truly focuses on students who need the most help and is equitable across all schools. We strongly support the focus on the lowest-performing students, no matter what group they come from. That does a number of things. It reduces the number of components…within the accountability system and places the focus on students who truly need the most help….It also reduces the need for small n-sizes. If you’re looking at the lowest-performing students in any given school, it’s a larger n-size than a lot of the race or curricular subgroups. I still understand the impulse, but I’ve come to see this approach as a big mistake. That’s because it signals to schools that their low-achievers should be a higher priority than their high-achievers. And in a high-poverty school especially—where everybody is poor—that has the unintended consequence of hurting high-achieving, low-income students. As I write in my new book, Education for Upward Mobility, these strivers deserve to be top priorities too. They are the low-income students with the best shot at using a great education to reach the middle class; to succeed in advanced courses in middle school and the AP program in high school; and to make it to and through four-year universities, including elite ones. Yet too often their needs are an afterthought. 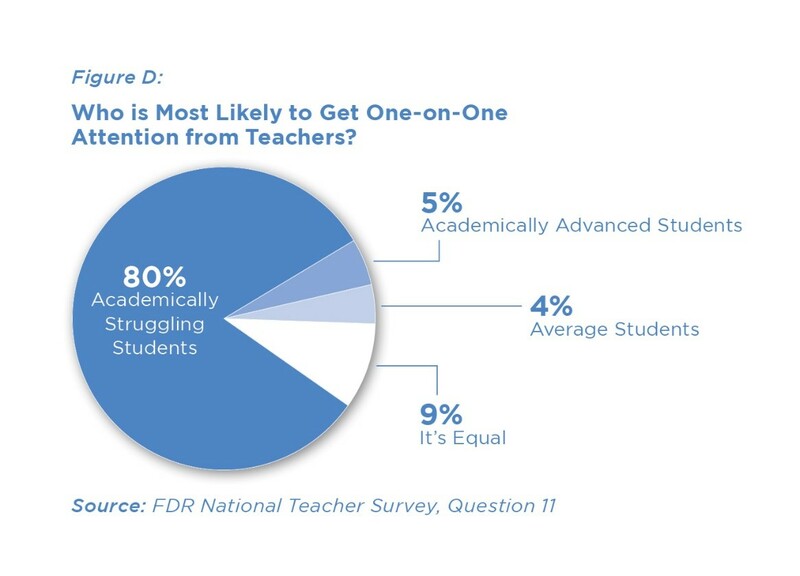 In 2008, we at Fordham asked teachers whether they prioritized the low-achievers or high-achievers in their classrooms. It wasn’t even close. That was back when NCLB was placing pressure on schools to get low-performing students over a modest “proficiency” bar—even while tacitly encouraging them to ignore the educational needs of their high-achievers, who were likely to pass state tests regardless of what their schools did for them. This may be why the U.S. has seen significant achievement growth for its lowest-performing students over the last twenty years (especially in fourth and eighth grades, and particularly in math), but minimal gains for its top students. Thankfully, under the Every Student Succeeds Act, states now have the opportunity—and face the challenge—of designing school rating systems that can vastly improve upon the model required by NCLB. And one of the most important improvements they can make is to ensure that their accountability systems encourage schools to pay attention to all students, including their strivers. For the first academic indicator required by ESSA (“academic achievement”), give schools extra credit for achievement at the “advanced” level. Under ESSA, states will continue to measure the performance of students who attain proficiency on state tests. They should also give schools extra credit for getting students to the advanced level (such as level four on Smarter Balanced or level five on PARCC). For the second academic indicator expected by ESSA (student growth), grade schools using a true growth model that looks at the progress of students at all achievement levels, not just those who are low-performing or below the “proficient” line. Florida is not alone. Regrettably, many states still don’t consider student growth; alternatively, they may use a “growth to proficiency” system, which continues to encourage schools to ignore the needs of students above (or far above) the proficient level. Using a “value-added” or “growth percentile” method for all students is much preferred. When determining summative school grades, or ratings, make growth—across the achievement spectrum—count the most. ESSA expects states to combine multiple factors into school grades, probably through an index. Each of the three academic indicators (achievement, growth, and progress toward English proficiency) must carry “substantial” weight. But in my view, states should (and under ESSA, they are free to) make growth matter the most. Otherwise, schools will continue to face an incentive to ignore their high-performers. Include “gifted students” (or “high achieving students”) as a subgroup in the state’s accountability system, and report results for them separately. Finally, states can signal that high-achievers matter by making them a visible, trackable “subgroup,” akin to special education students or English language learners, and publishing school grades for their progress and/or achievement. (Obviously, it makes little sense to report that high achievers are…high achieving. But whether they are making strong growth is quite relevant. Alternatively, states might publish results for students labeled as “gifted,” though that opens up a can of worms about how those labels are applied.) To my knowledge, Ohio is the only state that currently does this. What states should certainly not do is focus on the progress of just one group of students. All kids—and particularly all kids from disadvantaged backgrounds—deserve the best we can give them. Let’s not tell their schools otherwise. Michael J. Petrilli is President of the Thomas B. Fordham Institute.